We have all seen those TV commercials for MasterCard. They start by identifying some things that people can buy with their MasterCard, then show a moment that is priceless and end by saying, "There are some things money can't buy, for everything else there's MasterCard." I'm not unlike those agencies promoting their favorite credit card. I'm here to advertise. You see, my life is a commercial for others to see. I'm a card carrying representative for the Master's Card. That's right, the MASTER'S CARD. Let me tell you about it. There are no finance charges, no payments due. My bill has already been covered...it's a prepaid deal. I couldn't afford the price, so Jesus stepped in and paid it for me. My Name is written on the card for all to see. It is accessible twenty-four hours a day from anywhere in the world. The MASTER'S CARD has so many benefits it's hard to list them all. Let me share some of them with you...you might want to apply for a personal card yourself. Just for starters there is UNLIMITED GRACE. That's right, there is no preset limit to the amount of grace you receive from the MASTER'S CARD. Have you been looking for love in all the wrong places? Then, look no farther than the MASTER'S CARD. It offers the greatest rate on love that has ever been offered. The MASTER'S CARD gives you access too many "members only" benefits. Want real joy despite the difficulties of life? Apply for the MASTER'S CARD. Another great thing about the MASTER'S CARD is that it never expires. Once you're a member, you're a member for life...eternal life, that is. Membership has its privileges, you know. 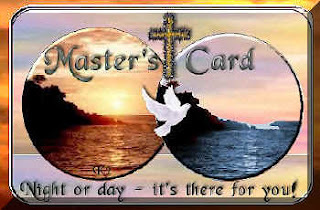 How do you receive the MASTER'S CARD. Dial 1-800-ROMANS10:9 "if thou shalt confess with thy mouth the Lord Jesus, and shalt believe in thine heart that God hath raised him from the dead, thou shalt be saved." Jesus is standing by right now to take your call. Don't delay. This great offer won't last forever. Peace, joy and hope: Invaluable. Faith, contentment and assurance: Inestimable. Salvation: Priceless. There are some things money can't buy. For those, there's the Master's Card. Why not be an advertisement for the MASTER'S CARD. Let your life be a commercial today for Jesus Christ. Dear Lord, We pray today that we would be the advertisement for You today. We thank You for the Salvation You have given to each of us, help us share that with those in our live. In Jesus’ name, Amen.